Traditionally used as a sedative, and to relieve barbiturates, sedative drugs and/or other herbs with sedative properties. Consult a health care practitioner prior to use if you have depression and/or related diseases. Do not use if pregnant or breastfeeding. Eleotin® Bentley Helps promote healthy glucose levels. Eleotin® A700 Traditionally used in Traditional Chinese Medicine (TCM) to tonify the spleen: for spleen deficiency presenting with the lack of appetite, fatigue, and diarrhea. Traditionally used in TCM to tonify the lungs and to promote discharge of pus and generate flesh: for chronic ulcerations and sores due to deficiency that have formed pus but have not drained or healed well. Eleotin® V3D Helps in the normal development and maintenance of bones and teeth, in the maintenance of good health, and helps in the absorption and use of calcium and phosphorus. Eleotin® Zn330 Used as a factor in the maintenance of good health, helps in tissue formation and helps the body to metabolize proteins, fats and carbohydrates. 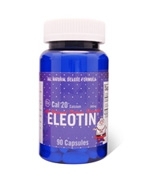 Eleotin® Cal20 Helps in the maintenance of bones and teeth. Helps to prevent bone resorption and osteoporosis. 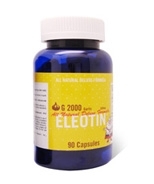 Eleotin® G2000 Helps maintain cardiovascular health. 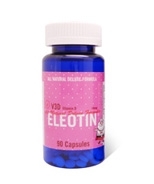 Eleotin® AL88 Traditionally used as a laxative, and a vermifuge. Eleotin® H55 Traditionally used as a sedative, and to relieve barbiturates, sedative drugs and/or other herbs with sedative properties. Consult a health care practitioner prior to use if you have depression and/or related diseases. Do not use if pregnant or breastfeeding.